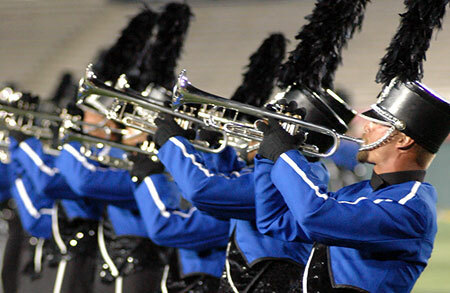 Drum Corps International (DCI), the world leader in producing and sanctioning touring marching music competitions, will again broadcast its dynamic and award-winning World Championship television program on ESPN2 Wednesday, Sept. 5, 2007 at 10 p.m. Eastern time / 7 p.m. Pacific time. The program will be presented in part by NAMM, the International Music Products Association. The television event will be the third prime-time broadcast of the program on ESPN2 since 2005, and will be available to more than 88 million households. After the initial airing, the two-hour program will be rebroadcast on ESPN2, split into two one-hour episodes first on Tuesday, Sept. 25 at 2 p.m. Eastern time and then on Thursday, Sept. 27 also at 2 p.m. Eastern time. this year's World Championship broadcast on ESPN2. "Drum Corps International is excited to air our World Championship broadcast for the third year on ESPN2," said Drum Corps International Executive Director and CEO Dan Acheson. "We expect to have drum corps fans new and old tuning in this year to see the incredible achievements and exciting performances of the world's most elite and exclusive marching music ensembles." The broadcast, which received higher-than-expected Nielsen ratings in 2006 during its second year on ESPN2, will feature excerpts from the 2007 World Championships hosted the second week of August at historic Rose Bowl Stadium in Pasadena, California. Featured segments will be drawn from the competitive performances of the 12 elite corps competing for the coveted Drum Corps International championship trophy. The telecast also will include "behind-the-scenes" features providing captivating insights, profiles and perspectives of this highly competitive display of world-class athleticism and extraordinary musical talent. Find more information on www.DCI.org/TV.